Bi-monthly direct link between Le Havre and Pointe des Galets. Service exclusively dedicated to RORO and to conventional traffic on mafi. 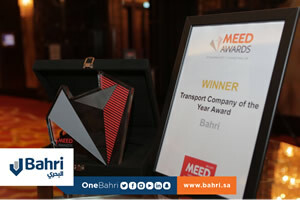 Congratulations to BAHRI voted Best Breakbulk Sea Line of the Year at the "MEED Awards 2017" ceremony held on November 29 in Dubai. Shipping Agency Service in Le Havre in France and three other subsidiaries of the Naxco Group, Slavenburg & Huyser bv Rotterdam in the Netherlands, DKT Allseas Shipping Ltd. in Tilbury, UK and Unamar NV in Antwerp, Belgium, represent Bahri's interests. SHIPPING AGENCY SERVICE, MADSHIP, BOLLORÉ LOGISTICS, GEEST LINE (British shipowner present in the Caribbean for more than 60 years) and stevedore companies at arrival and departure, offered their services in transportation and logistics and provided the Food Bank with two containers filled with foodstuffs for the victims of Saint Martin and St. Barthélemy. The first container has already arrived in Guadeloupe and the second one left Le Havre last Wednesday onboard MV TIMOR STREAM. Operating in the French West Indies, Naxco Group responds to the very first needs of the victims and hopes for a fast recovery in the region. DAL Indian Ocean: Le Havre / Réunion and Maurice now in direct ! We are pleased to inform you that we have been nominated exclusive agent for France by DETRA DETRA MEDITERRANEAN SHIPPING (DMS), with immediate effect. We are pleased to advise that DAL has been awarded the status of Authorised Economic Operator (A.E.O) by the Hamburg Customs Authorities with effect from 10th April 2014. We are pleased to advise that EUCON SHIPPING & TRANSPORT LTD were awarded with Authorised Economic Operator (A.E.O) with effect from 3rd April 2014. We are pleased to inform you that the Irish Exporters Association awarded EUCON as the “Short Sea Shipping Line of the Year 2013” against some tough competition in this category as Stena Line and CLDN/Cobelfret. This is the 2nd time in 3 years that EUCON have won this award. Eucon maintains her position as market leader in the Short Sea trade on the Irish Sea. We are pleased to inform you that DAL is now able to offer a weekly service to Beira (Mozambique) in addition to Maputo and Nacala, va Durban on the IMMA service of U.A.F.L. United Africa Feeder Line (UAFL) will team up with Evergreen Line to launch the new “IMMA” Service linking the Indian Sub-Continent with Mauritius, Madagascar, South Africa and Mozambique from late April 2013. Three 2,500 teu vessels will be deployed on the joint service. The first sailing is scheduled from Karachi (Pakistan) on the 22 nd of April 2013. United Africa Feeder Line currently operates the Middle East Express (MEX) Service into East Africa and the Indian Ocean Islands, together with a number of regional feeder services. The addition of the “IMMA” Service enables UAFL to support the growing trade between ISC countries and IOI / South & East Africa, and yet again it re-emphasizes UAFL’s commitment to its customers in the region and to the region in general.